The Egyptian Initiative for Personal Rights (EIPR) published a report addressing the deepening marketization of prison life. 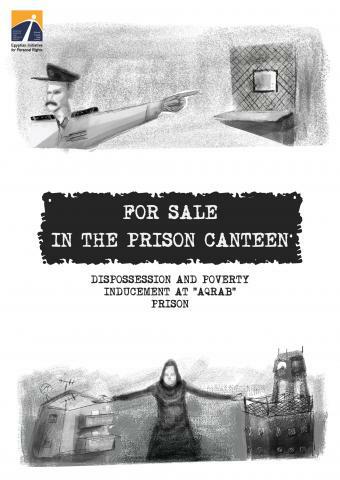 The report, “For Sale in the Prison Canteen “Aqrab” Prison” shows how the most basic needs of prisoners, that should be provided for by the prison authorities by law, are sold at exorbitant prices for the sake of canteen’s profits. The report is structured into three chapters. The first, links Egypt’s economic policies as influenced by a loan by the International Monetary Fund (IMF) and how that has economically impacted life in prisons. This chapter traces the local and global history of prison austerity, and how the acute inflation caused by the IMF loan is experienced by prisoners and their families, situating this within the historical context of austerity measures. The second chapter focuses on the general trends of abuses within the prison. The third, and final, chapter asserts that the economic exploitation taking place at the prison is another form of abuse suffered by inmates and perpetrated by the prison authorities. EIPR sees that these trends amount to intentional poverty-inducement by the Ministry of Interior against the population of the Aqrab prison.